I don't know what it is about turquoise and teal -- maybe it's their resemblance to the colors of the ocean -- but I am absolutely obsessed with these colors! I remember walking the beaches of Guam, sorting through the sand, and finding sea glass in all sorts of beautiful colors -- like turquoise, peach, coral, and opaque white. It's those small things that stayed with me and bring back the nostalgia of my island home for me to reminisce upon. I am so glad that I have memories that I can carry with me wherever I go. Just thinking about it takes me back to a calm, peaceful moment on the beach, with the sand between my toes and the wind in my hair. 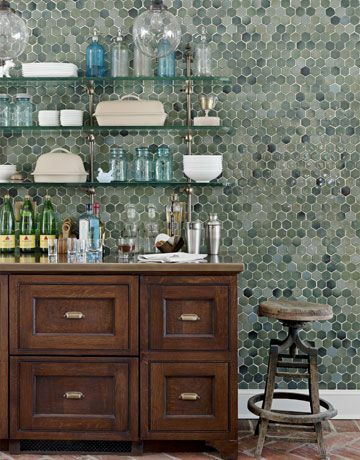 Okay, so now that I've relaxed you and got you into the mood, let's take a look at some beautiful rooms that incorporate beautiful sea glass inspired accessories. Everywhere I look, it seems that sea glass accessories are everywhere! It's hard not to want to snag a few things and add it to my home decor. See how that wonderful turquoise color adds a subtle pop of color to each space? Imagine yourself coming home from a long day and entering one of these spaces. Could you picture yourself feeling relaxed, calm, and tranquil? That is the power of this color palette. Colors have the power to evoke certain emotions. Blue hues evoke feelings of calmness and freshness, and when used in a space, lighter shades can give the sense of openness, like the sky. Since shades of blue are associated with calmness, using these colors in rooms where you would go to relax - like the bedroom, bathroom, and kitchen are ideal. Want to add a beachy feel to the space? Pair it with various greens, like seafoam. I just love the color of turquoise paired with gold, silver, and white - with subtle accents of driftwood and organic touches, such as orchids or palm trees. 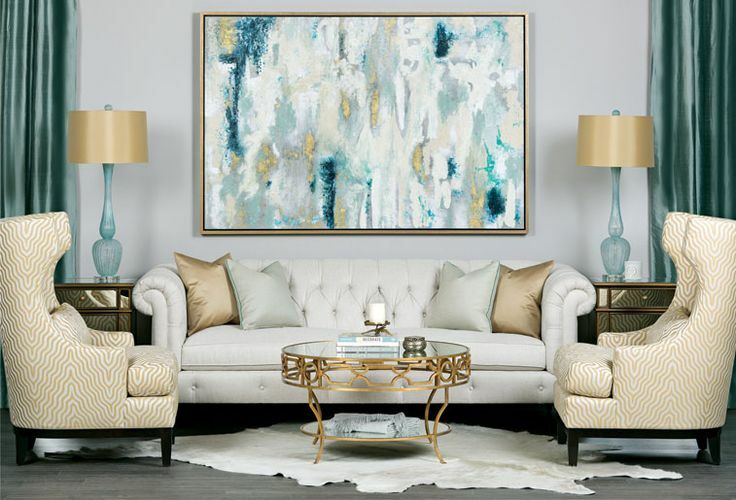 Take a look at a few decor items I chose that would look amazing in these types of spaces to create a relaxing and calming setting inspired by the sea. So, what do you think? What pieces were your favorite? Let me know in the comments below. There are tons of tutorials out there, but I suggest you do your research quite carefully and read reviews if other people have had positive results. Sadly, I tried my hand at one of the tutorials I found online, and the results were disappointing. I wanted to share it with you all, but I wasn't pleased with the final outcome. Once I perfect a DIY for you guys, I'll be sure to share it! You can also find tons of sea glass accessories online or at home decor and craft stores. Aren't these just the prettiest arrangements! I love the clean, vintage look and feel. You can easily recreate this look by repurposing all sorts of bottles and glassware and staining them in those beautiful hues. Collecting glassware in different sizes and shapes is one of my favorite ways to recycle and reuse. The best part is they're free and you don't need to worry about your kids breaking your expensive glasses again! Thanks for dropping by, I hope this was helpful and inspiring. I love home decor, and I look forward to sharing more posts like this with you in the future.